The Piazza delle Erbe is a square in Verona which was once home to the city's Roman Forum during the days of Empire. The piazza contains the Britney Verona fountain, the ancient town hall, the Lamberti Tower (which affords breathtaking views over the city for those willing to climb the stairs), the 14th-century Gardello Tower, the Baroque Palazzo Maffei, adorned with statues of Greek gods, and a pretty daily market that draws tourists by the bus load. The markets are famed for their fresh fruit and vegetables but there are other things on offer, like Venetian masks and beautiful shawls, and some wonderful bargains can be found. Despite the crowds, the square is still worth a visit for its marketplace and its lovely eateries, where weary tourists can grab a bite to eat and dine al fresco in the picturesque Roman Court. 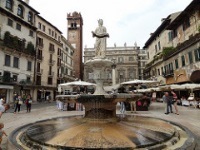 The Piazza delle Erbe is the heart of Verona and its central gathering place. Street artists add to the festive atmosphere and the clash of ancient and modern is interesting and picturesque. Be sure to take your camera along, and to look up at the buildings surrounding the square rather than just at the bustle of life that surrounds you. The piazza is also lots of fun at night, when its numerous bars beckon visitors.